Give your employees the Edge they need. THE EDGE12 PACKS MEDIUM-DUTY SLICING, AN AVERAGE OF 2.5 HOURS/DAY INTO AN ECONOMICAL PACKAGE. The Edge12. Efficient. Economical. Easy to clean. Just three of the many ways it can give your employees—and your operation—the edge you need to keep customers coming back for more. And with added protective features, you’ll feel good about having it in the back of the store, too. Not only is the Edge12 easier to use and capable of handling larger loaves, but it also offers added protection for every slice. The gauge-plate interlock system ensures the plate can’t be opened and the knife exposed when the tray is removed. The carriage-interlock ensures that the product tray can't be removed when gauge plate is open and the knife is exposed. Two additional protective features are the permanently mounted ring guard and rear-mounted removable meat grip. The 1/2-H.P. 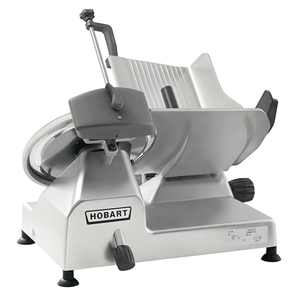 knife drive motor and poly V-belt drive system combine to provide an enduring system that will deliver optimum results, slicing cheese and meat without shredding. 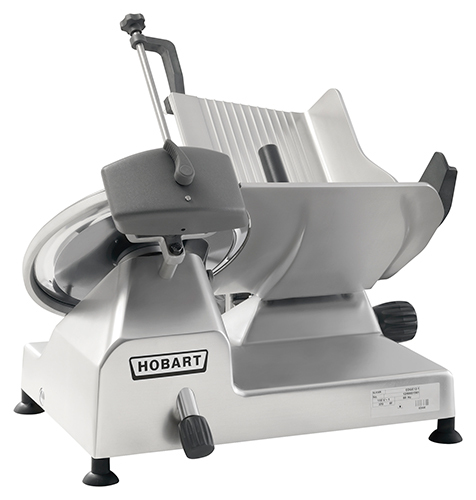 The motor drives the knife for clean, precise slices. The poly V-belt drive system is designed for quiet operation and is more economical to service and repair with reduced parts and service time. The 12"-diameter chrome-page, carbon steel knife that can be easily sharpened with the top-mounted Borazon stone. The single action stone sharpens in approximately five seconds. The Edge slicer is made for easy cleaning. The single-piece anodized aluminum base leaves few cracks, crevices where product can lodge and bacteria can grow. It can be quickly wiped down for easy cleaning. The anodized aluminum carriage and knife cover are removable and can be put into a three-compartment sink for more thorough cleaning. The Borazon sharpening stone is also removable and submersible. The slice deflector is also removable for cleaning.